Controlling a Rover via a PS2 joystick. Home DC Motors Controlling a Rover via a PS2 joystick. We are going to use a Playstation 2 wireless joystick or compatible to control the 4×4 Rover. We will see how to use the control libraries: PSX. We will show how to detect the strokes of the joystick’s buttons. The control via Bluetooth is practical because we always have a smart phone at hand, but it is a little erratic and in the end always leaves us an uncomfortable feeling or perhaps it runs down the battery too quickly and at best, its use is uncomfortable for long periods of time. Therefore, as we always say, finally someone found a solution, “as God commands”, and that is why the market provides us a flawless solution to control our robots, engines or projects of any kind via a single remote command, which will be familiar to many people: a PlayStation 2 wireless joystick or compatible. These controls are very cheap nowadays (due to the fall in the prices of all the electronic devices) and have the great virtue of being ergonomic and very comfortable to handle, besides providing two analog joysticks and 14 digital buttons. These joysticks come with a wireless receiver, which can be connected to our Arduinos and used to receive the control signals, without very much trouble. In this chapter we are going to see how to connect this type of wireless joystick to our Arduinos and you will see that, thanks to the libraries devceloped by Mr. Bill Porter, it is very, very easy to implement and use. 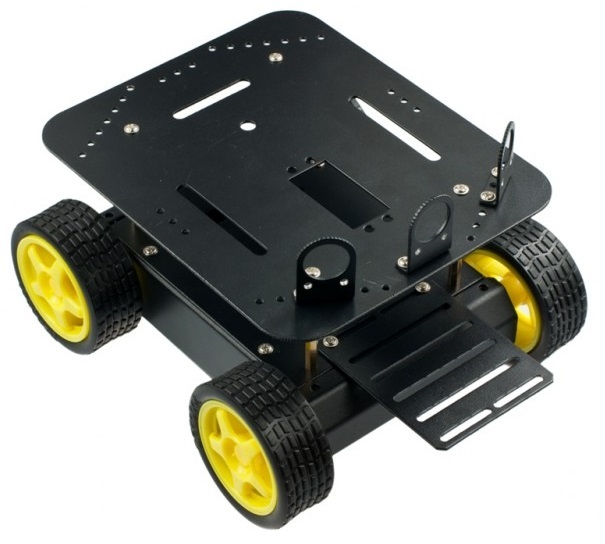 As we are assembling a 4×4 Rover, we will use an Arduino Mega, as in previous chapters, in order to build a functional robot. When we started to look for information on this type of control on the Internet, we found it quite confusing and, what is worse, we spent a lot of of hours trying to make it work without success. When connecting the wireless receiver to your Duino you could wrongly plug it the other way round (We certainly did it and it gave us a lot of trouble before realizing) because the information on the Internet is a little dark And you have to read between the lines to understand what is all about. As soon as you connect it properly there will be no more trouble. If you look for information on the Internet, you will find that they each pin is usually described according to a color code, which perhaps may be standard in the Sony controls but confusing if you use a compatible joystick, so forget about the colours. You don’t need to worry about understanding the purpose of each wire, since the library that we are going to use, will be in charge of the management, provided that we define the pins correctly. If you have a flat or L-shaped pin header it should be ideal, because you have a group of pins connected directly to the Mega pins and the hook is more reliable, because they are joined. Again, we have to use GND and 5V but, as the consumption is despicable, we can set to HIGH the pin 30 and to LOW the pin 28. Although the documentation says that the pin 30 must be powered to 3.3V, we have powered it with 5V without any problem for a long time. First you have to download the library PS2X_lib and install it following the standard procedure. As usual, we will start with a minimal sketch to check a few buttons and later we will see the rest of the available controls. Let’s start by including the library and creating a PS2X object to handle the joystick. Then we define the pins inside the setup() function so that we can drive the receiver with GND and 5V. We had already used this trick to drive something via an Arduino pin, but remember that it should not exceed 40 mA. Note that here is where we specify which pins we are going to use and to which functions of the remote control correspond, so we chose them to be consecutive (remember that laziness is very valuable if it saves us useless work), but you can define whichever pins you want, according to the Arduino model you are using. Let’s make a small sketch to detect which buttons are pressed on the left side: UP, DOWN, LEFT, RIGHT. If you upload this sketch Sketch_96_1 to your Arduino board, you will see in the serial monitor a message showing which button has been pressed. Naturally, the library provides variables for all the available buttons of the joystick via the ps2x.Button() function. Plus the center buttons, SELECT (PSB SELECT) and Start (PSB START). Finally to detect the movement of the two joysticks included in the controller, you have to understand that, as they provide analog values, we have to read two values from each, X and Y, just like we did in a previous chapter: Prototype with Joystick and Servo. Now it may seem very complicated but it is a nonsense (seriously), the PS2 joystick has so many buttons that you have to use a lot of flags to define each one, but it is always the same. The library comes with a great example of how to use it, but has the disadvantage that it shows all the possibilities at the same time and can be a bit overwhelming, although if you are going to use this kind of joystick I certainly recommend you taking a look. The example is very clear and self explanatory but uses almost all the buttons and also check if your controller is a typical Dual Shock or if, on the other hand, is a Guitar Hero controller, which opens a lot of possibilities to musical applications in Arduino with one of those guitars. For those of you who have made the assembly like in this example, we have put the corrected sketch to work at first, in which we have simply adapted the included example to use our pins. We only have to write a full sketch to include the control of the motors and the direction of the movement according to the strokes of the remote control. This is where we initialize the PS2 receiver with the pins that we are going to use. After that, we make sure that there is no error and if so, we show that a compatible joystick has been found. Finally we read the type of joystick found, that can be either a DualShock = 1 or Guitar Hero = 2 joystick. The final loop is a variant of the first sketch of this chapter, to which we have added the control of the movements of the rover that we saw in previous chapters. We have used a PS2 joystick to control our projects. We have introduced the PSX libraries that will enable us to use the Sony DualShock and Guitar Hero joysticks. We have seen how to embed these commands into our projects and recognize the keystrokes performed.